← Can a Childhood Dream Become a Business? For 20 years, Colette Wilson earned a good living as an accountant who did work for the federal government. Now she’s found joy in pleasing taste buds through scrumptious hors d’oeuvres and mouthwatering sweets. 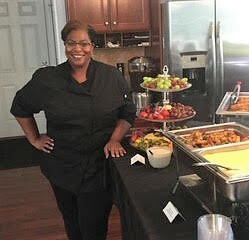 Wilson is a co-founder of ColMoni’s Catering, a Lorton, Virginia-based business that caters a full range of events throughout the Washington, D.C. area. ColMoni’s creations include a full array of specialty cakes and other desserts as well as pre-made meals for busy families and professionals who don’t have time to cook. How did Wilson make the leap from accounting executive to culinary entrepreneur? Smart financial planning, a strong work ethic and a willingness to ask for help (even when she didn’t want to) all came into play. So did a desire to identify and pursue her true passion. This wasn’t a top priority at the beginning of her career, however. After graduating from Mary Washington College, Wilson took a job with a CPA firm in Alexandria, Virginia. She worked her way up the corporate ladder as a CPA, making partner before she turned 29. Along the way, she married and had two children. Wilson was good at what she did, as evidenced by her appointment as Chair of the Virginia Society of Certified Public Accountants in 2012. By then, she was in her early 40s and had a long list of clients. But she also had an exhausting schedule and yearned to spend more time with her children. After a talk with her husband and a meeting with her financial advisor, Wilson made a life-changing decision. She sold her partnership interest and left the accounting firm that had been her home for so many years. “I wasn’t sure where I was headed but knew I needed to take a break and wanted to do something different,” she says. During that time, she gave herself permission to explore her interests. She began cooking for others because it was something she had always enjoyed doing. In June 2013, a former colleague hired her to cater an event, marking her first paid gig. Another pivotal moment occurred in March 2014. That’s when Wilson met Brenda Brown, who was in the early stages of opening a business incubator for culinary entrepreneurs. While Brown searched for an incubator location, Wilson prepared food in her own kitchen and developed a following as a caterer. She also recruited Monica Yates, her longtime friend and college roommate, to be her business partner. In 2015, Brown found space in Lorton and opened Frontier Kitchen. That March, Wilson and Yates – both in their mid-40s – put in $10 thousand each and combined their first names to found ColMoni’s Catering, LLC. They joined Frontier Kitchen as one of its first startups. The move provided access to a commercial grade kitchen as well as training in marketing, pricing and other aspects of running a culinary business. 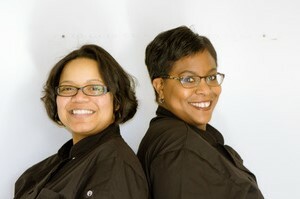 It also enabled Wilson and Yates to join a supportive community where they could learn from other food entrepreneurs. ColMoni’s Catering has seen steady growth since its launch three years ago. Sales increased 18% from 2015 to 2016, and 19% from 2016 to 2017. As of the third quarter in 2018, the company had matched 2017 revenues and expects to do well over the holidays. Plan ahead. Wilson and her husband began saving money towards long-term goals several years before she went out on her own. As a result, the couple had sufficient reserves to tie them over while ColMoni’s Catering found its footing. Get a financial advisor. The Wilsons already had an advisor whom they liked and trusted. When Colette Wilson decided to leave her accounting firm, the advisor devised a financial plan based upon her husband’s income. A portion of the accounting firm’s payout funds was used to create a “salary” for Wilson as she explored career options. Have a safety net. While she builds the catering business, Wilson is maintaining her CPA license and her professional contacts in accounting. This gives her peace of mind should she decide to switch gears again in the future. Get help. Initially, Wilson was reluctant to reach out to others but soon realized that she couldn’t start a business by herself. “The more you know, the more you realize you don’t know,” she acknowledges. Compartmentalize your time. Like many late-blooming entrepreneurs, Wilson has both professional and family responsibilities. She organizes each day by blocking hours for different areas of her life. This lets her focus on one task at a time, whether it’s preparing a contract for a client or ordering uniforms for her children’s soccer teams. Going forward, Wilson wants to increase revenue and hire staff to prepare recipes so she and Yates can concentrate on running the business. Her long-term goal is to open a brick-and-mortar café one day. In the meantime, Colette Wilson is enjoying her entrepreneurial ride, which she’s doing at her own pace. For her, one of the best parts has been building a business on referrals. This entry was posted in Business, Career Changes, Careers, entrepreneurs, Entrepreneurship, Leadership, Retirement, Success and tagged cooking, Entertainment, Family, food, Work. Bookmark the permalink. Awesome job, Lynne! Very inspirational blog post.